Director General William Dar addressing participants of the FICCI workshop. As a scientific solution to improve crop productivity, biotechnology today plays an indispensable role in empowering the rural sector by boosting food production, enhancing income for smallholder farmers, and improving nutrition particularly in the developing countries of the world,” according to Director General William Dar. Speaking at a workshop on “Technology as a Driver for Agricultural Growth: Ensuring Farm Prosperity” organized by the Federation of Indian Chambers of Commerce and Industry (FICCI) held at Hotel Golconda, Hyderabad on 6 July, Dr Dar said that biotechnology has the potential to revitalize the agricultural sector and increase the profitability of farming. “India is facing a paradoxical situation where it has over 60 million tonnes of food grain reserves, while about 42 percent of the country’s children are malnourished due to lack of nutritious food,” Dr Dar observed. He stressed the need to move beyond Bt cotton and embrace genetically modified food crops that can make an enormous contribution in the fight against hunger, poverty and malnutrition. While the private sector now leads in new sciences like biotechnology and information technology, Dr Dar emphasized that it is imperative for the public sector to continue its crucial task of developing scientific innovations for the poor. He cited the Institute’s partnership with the Department of Biotechnology, Government of India in setting up a Platform for Translational Research in Transgenic Crops (PTTC), to serve in translating proof-of-concept technologies from public and private sectors to agri-biotech products of importance to national and global agricultural needs. Dr Dar highlighted that ICRISAT uses genetic engineering technology as a last resort when problems cannot be solved through conventional means and approaches. FICCI organized the workshop to build public awareness of the benefits of cutting-edge technologies such as modern biotechnology to agricultural growth and farm prosperity. R Varshney with Bill Gates. Delivering a presentation during the meeting in Seattle. The event was held on 9 July in Seattle, Washington with nine other experts, and was chaired by Bill Gates and attended by his former and present associates (high level businessmen, entrepreneurs, philanthropists) and selected officials from the foundation and the Global Goods LLC. Global Good is an entity created by Bill Gates to hold patents, information and technology resulting from the foundation’s focus areas and collaborative engagements, aimed at solving social, health and economic problems in the developing world and in addressing education issues in the United States. The brainstorming session included presentations and discussions on five distinct, but interrelated, aspects of digital revolution for agriculture: architecture, genomics, ecological intensification, remote sensing, and information and communication technologies (ICTs). During the meeting, R Varshney delivered a presentation on “Genomics and Informatics for Digitalization of Crop Breeding” in which he provided an overview of the current status as well as future prospects of crop genomics in global agriculture in the next 3, 10 and 20 years. He highlighted the genomics work being carried out at ICRISAT and the Generation Challenge Programme under his leadership. The other two genomics experts – Jun Wang, Executive Director, BGI-Shenzhen and Bob Reiter, Vice President- Biotechnology, Monsanto Company shared their vision on sequencing technology and agricultural research in the private sector, respectively. 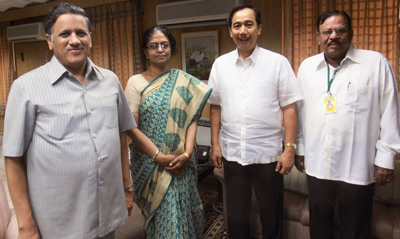 (L to R) former Chief Secretary of AP, Mr SS V Prasad; new Chief Secretary of AP, Ms Minnie Matthew; Director General William Dar; and FETS Program Leader Prabahakar Reddy. 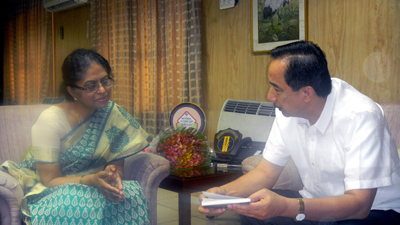 To renew their commitment as partners in the conduct of global, high-quality and impact-oriented agricultural research-for-development adaptable to and directly benefiting Andhra Pradesh (AP) and the whole of India, Director General William Dar met with the new AP Chief Secretary, Ms Minnie Matthew on 6 July at the latter’s office in Hyderabad. 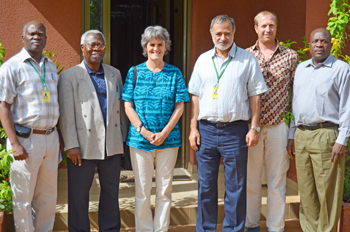 During the courtesy meeting, Dr Dar welcomed Ms Matthew as a new member of the ICRISAT Governing Board. Ms Matthew, on the other hand, expressed commitment and support to ICRISAT’s programs and initiatives to improve agricultural productivity in AP and in India in general, and agreed to facilitate the invitation to the President of India to be the chief guest during the Institute’s 40th anniversary celebration in September 2012. AP Chief Secretary, Ms Matthew, engaged in a discussion with Dr Dar on further strengthening AP and ICRISAT partnership. For four decades since ICRISAT was established, the Institute and the Government of AP have been actively working together to end poverty, hunger and environmental degradation in the State. Working mainly in the northern, central and southern districts, the partnership has generated pro-poor agricultural innovations and investments that enhanced agricultural productivity and improved livelihoods of smallholder farmers. ICRISAT-Patancheru will host the Annual Meeting of CGIAR Consortium Legal/Intellectual Property (IP) Network on 17-19 July. Led by Consortium Legal Counsel, Ms Elise Perset, and Consortium IP Consultant, Dr Sean Butler, the meeting will have participants representing 11 CG Centers (Bioversity, CIAT, CIFOR, CIMMYT, CIP, ICARDA, ICRISAT, ICRAF, IFPRI, ILRI and IRRI) and the Generation Challenge Programme (GCP). The group will also include a four-member delegation from the Australian Centre for Intellectual Property in Agriculture (ACIPA), which is working with the CGIAR Consortium on IP issues. The meeting will have extensive deliberations on IP-related activities in the Consortium and also on the draft Implementation Guidelines for the recently adopted CGIAR Intellectual Assets Principles. A Working Group was set up by the Consortium Office to prepare a first draft of these guidelines, which included Mr Hanumanth Rao from ICRISAT, Mr Rodrigo Sara from CIMMYT and Ms Virginia Jaramillo from CIAT. 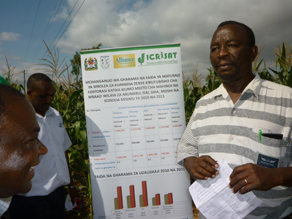 The Selian Agricultural Research Institute (SARI) based at Arusha, in collaboration with the Alliance for a Green Revolution in Africa (AGRA) and ICRISAT, organized a farmers’ field day on 25 June at Kwa Amanzi area, Kyomu village in Moshi District, Kilimanjaro Region, Tanzania. The activity aimed to promote the scaling up of Integrated Soil Fertility Management (ISFM) practices such as using improved maize and pigeonpea seed, P fertilizer microdosing, and conservation agriculture. The field day was part of the AGRA-funded project ‘Improving soil fertility, productivity and livelihoods of smallholder farmers in Tanzania through intensification and diversification of pigeonpea cropping systems.’ A total of 370 stakeholders (118 women and 252 men) along the maize/pigeonpea value chain including farmers, farmer associations, extension workers, seed and fertilizer companies, agro-dealers, financial institutions, marketing societies, and the media participated in the event. One of the highlights of the field day was the sharing of success stories by two women model farmers – Elishililia Mollel of Kikatiti, Arumeru and Rose Fratern of Babati. 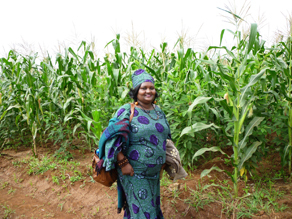 Among their achievements in their long years of pigeonpea production include: improved yield (from 2-3 bags per acre to 8-10 bags per acre), food security, income generation through sale of pigeonpea grain and seed, and ability to pay for children’s education and home improvement. Mrs Rose Fratern of Babati sharing her experiences in pigeonpea production. Mr P Mushi of SARI explaining pigeonpea benefit-cost ratio and P fertilizer microdosing in maize cropping systems. The farmers’ field day was conducted on a 1-acre farm of maize intercropped with pigeonpea (ICEAP 00040) applied with 20 kg/ha of P-based fertilizer as microdosing. Representing the Regional Commissioner for Kilimanjaro as guest of honor was the District Administrative Secretary for Moshi. Other participants included NVPR Ganga Rao (ICRISAT), Rebbie Harawa (AGRA), Isaac Savini (CIAT-TSBF), and researchers from SARI (Stephen Lyimo, Rose Ubwe, Phillemon Mushi, Marietha Owenya, Peter Sulumo). 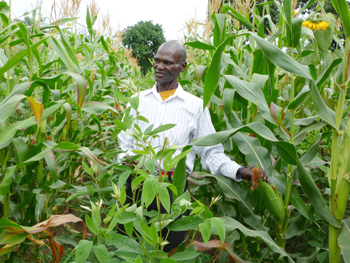 Farmer practicing maize-pigeonpea intercropping with encouragement from the Mungushi church. The team also visited PVS sites of maize intercropped with pigeonpea in Siha, Arumeru and Hai District. Reverend of Mungushi Lutheran Parish, Solomon Massawe shared that they achieved a net income of Tshs 6,595,000 (US$ 4,095.36) from the sale of maize and pigeonpea harvested in the last season from the 10 acres of farm owned by the church. The income contributed to the building of the Agricultural Technology Training Centre for the church, helped sensitize 350 members (298 women and 52 men) on improved technologies, and made possible the purchase of 115 improved avocado seedlings and the setting up of pigeonpea seed farm. The Dialogue on Designer Rice was a unique international event held at ICRISAT-Patancheru on 9-10 July. The Dialogue was attended by top plant geneticists and molecular biologists from across the world with the goal to deliberate on the prospects of ‘designer rice’ that would meet future challenges of global food-nutrition-livelihood security. Organized by the Society for Advancement of Rice Research, the dialogue was co-sponsored by ICAR, the Department of Biotechnology, Ministry of Science & Technology, Acharya NG Ranga Agricultural University, ICRISAT and the Protection of Plant Varieties and Farmers Rights Authority and was generously supported by some private sector enterprises. The dialogue was attended by international experts from six countries along with eminent Indian scientists who presented lead papers, as well as international panel of discussants and outstanding young scientists/research scholars. Participants of the dialogue at Patancheru. (L to R) George E Okwach, Prof Babatunde, Eva Weltzien, Farid Waliyar, Tom Van Mourik and Hakeem Ajeigbe during the brainstorming on ICRISAT-Nigeria collaborative project on sorghum. The Team Leader of the Sorghum Transformation Value Chain (STVC) of Nigeria’s Federal Ministry of Agriculture, Prof Babatunde Obilana, along with Dr Hakeem Ajeigbe, ICRISAT-Nigeria country representative, visited ICRISAT-Bamako on 2-6 July for a brainstorming on a Nigeria-ICRISAT collaborative project on sorghum. The said visit was a result of the discussion between Honorable Minister of Agriculture, Dr Akinwumi Adesina and Director General William Dar during the latter’s recent visit to Nigeria, to pursue collaborative projects on sorghum particularly in the areas of breeding, seed system development, and mobilization of improved technologies. The meeting, led by Dr Farid Waliyar (WCA Regional Director), was a three-day brainstorming to prepare a long-term project proposal on sorghum for funding by the Federal Ministry of Agriculture, Nigeria. In his opening address, Dr Waliyar emphasized the importance of sorghum to Nigeria which is consumed in various ways by over 80 million Nigerians. Prof Obilana, himself a former ICRISAT sorghum breeder, expressed hope that the present collaboration will replicate or even exceed the impact of ICRISAT research in Southern Africa that led to the commercialization and industrial utilization of sorghum and the release of several varieties including Massia, the most popular variety in the region. Prof Obilana further pointed out that sorghum has a very high commercialization potential in Nigeria and that STVC will work in three identified value chains: for the malting industry; for high energy and fortified food; and for high quality sorghum flour. Nigeria hopes to increase sorghum production in the country by 4 million mt in the next 4 years. 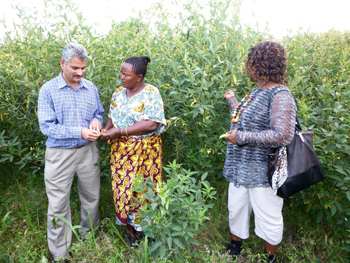 ICRISAT’s support is critical for success based on the Institute’s experiences in up-scaling agricultural technologies in India and in partner countries in Africa.